Discovered in May 1992 during a joint survey carried out by the Ministry of Forestry of Vietnam and WWF in the Vu Quang Nature Reserve in north-central Vietnam, Saola (Pseudoryx nghetinhensis) remains almost as elusive today. This forest-dwelling species is distributed in scattered locations in the Annamite Mountains along the Laos-Vietnam border. Despite little scientific information available, there is no doubt that its existence is severely threatened. No formal surveys have been undertaken to determine accurate population numbers, but IUCN estimates the total saola population to be less than 750 individuals. 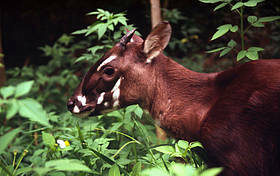 The main threats to the saola are hunting and fragmentation of its range through habitat loss. Snares set in the forest to capture wild boar, sambar or barking deer also trap saola, while hunting to supply the illegal trade in wildlife has led to a massive increase in pressure on the species. In the north of their range, saola are hunted for their horns, which have become prized trophies. WWF is currently monitoring for saola in eastern Xe Sap NPA in Laos, and also across the border in Vietnam through camera trapping. To compliment this research, WWF focuses on community based forest management, capacity building, and strengthening of law enforcement to give this secretive species a chance of survival. Almost 50,000 snares have been removed in critical saola habitat as part of WWF’s CarBi programme. This is a major boost to the animal, as it needs a safe, snare-free forest to live within.